As I said in last month's review, ISK velocity is the first stat I jump to. 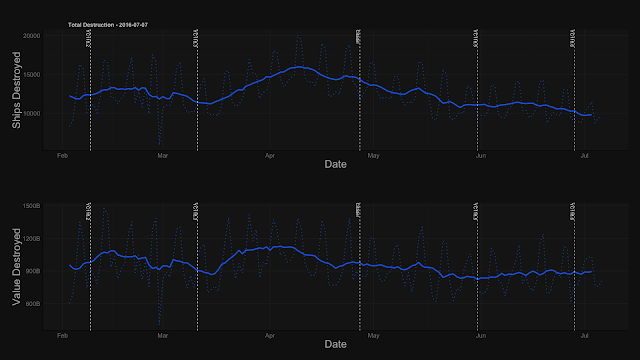 I have this hope that ISK velocity will be useful in building better PLEX forecasts, and it's a good market activity metric to pair against PVP numbers. Now with the benefit of hindsight, it's a little easier to draw the correlation between ISK velocity and PLEX direction. With things cooling to a new normal level, I'm looking forward to tempering expectations a little better going forward. 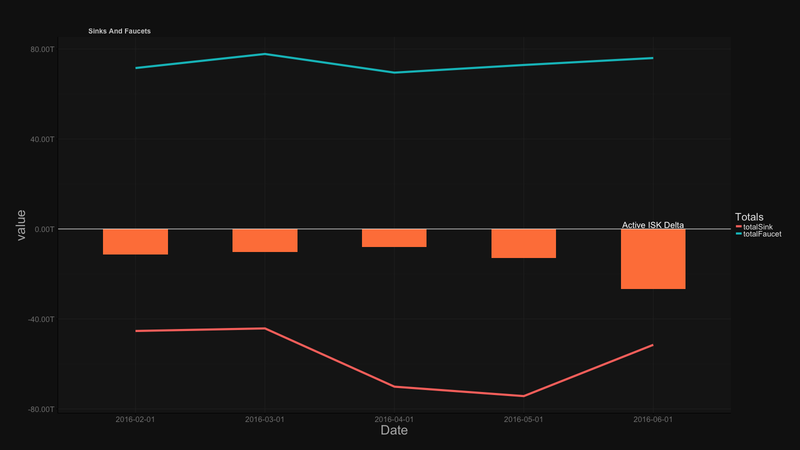 When it comes to PLEX's record slide over the spring, it's useful to picture ISK velocity and PLEX prices together. February had skill trading release, March/April had World War Bee, May had Citadels. In this historic period of cash demand, PLEX (like gold) acts as an easy way to get at that liquidity. With big door-busting features calmed down for the summer, I'm happy to see ISK velocity staying strong (~0.7) vs pre-skill-trading levels. Small Note for the stats nerds: Quant's report uses a bi-directional 30d moving average to calculate ISK velocity. I would rather use one that only looks backwards. Will probably tweak the stat slightly going forward, which will take us out of alignment with Quant's official charts. When it comes to activity statistics, I'm actually surprised how well June did in aggregate. Though we're seeing a general cooling, we're actually above the points I originally spitballed. Specifically, the slight uptick in value destroyed is interesting. I'm not ready to pin this entirely on the new event/opportunity system, but these are positive first metrics for a contentious feature. Though the general statistics look good, Citadels are weird. 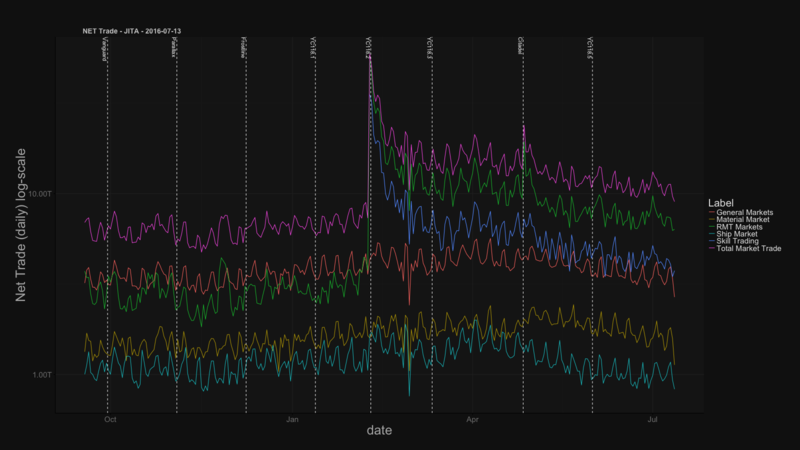 We can't yet track them in our stats (though recent updates have cleared up the API blindspot) and a wild west of bug-or-feature has made it hard to get a solid hand around Citadels in the long term. Rhivre has been the authority when it comes to citadels. Specifically, she brought up that the June Faucet/Sink graph looked particularly light. Quant has responded that Citadel data should be in the report. The sinks retracted a lot more than many originally expected. Also, the big dip in Active ISK Delta (money leaving the system because of account lapse) is mildly troubling. Though April/May proved to be record setting in terms of ISK sinks, June returns us back to the ~45T level. Half because blueprint outlays (citadels) have tapered off, and half because a chunk of broker fees are now going to players in Citadels rather than being properly destroyed. Citadels remain a big topic in many market channels. Specific recent highlights are things like a 0% fee Citadel dropping near Jita, and Hek not being in the citadel exclusion list. Also, though there are some big bugs out there (Citadel timers are immune to TiDi), the strategic value of these structures is coming into focus. We stand by the current advice that summer is the time to lock in positions. There are a lot of set pieces that should make the fall very interesting when activity picks up. Coming into late July/August, things should be very quiet. 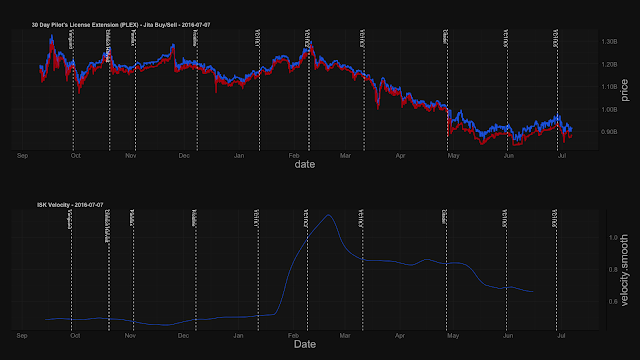 It's a heavy vacation season, and CCP has historically been very quiet in August. General activity is staying well stoked given the traditional retraction, and it will be up to CCP to keep that fire stoked with activities. Again, it's my strong advice that this is the time to grind up that cash, stash away those cheap PLEX, and generally recuperate ahead of the fall. Many signals are pointing to an interesting season coming up and Alliance Tournament and EVE Vegas should get the hype trains moving. Meanwhile, at ProsperHQ, we're still chugging away on our tool revamp. Work starts in earnest this week on our data backend, and goals to get you all access to our data continues roughly on schedule. Once a few more pieces come together, expect a "state of Prosper" blog in the next few weeks! No comments on the collapse in trade volume from 600 trillion to 400 trillion over the past 3 or so months?